Šri Sudaršana Chakra: Similar to the Ankuša, the Sudaršana Chakra is also a divine weapon. Šri Sudaršana Chakra is one of the five weapons of Šri Vishnu, Who is therefore a powerful ally of Šri Vishnu in protecting the devotees and thwarting the efforts of those who wrong the devotees. We need to purify our body and mind before approaching Šri Sudaršana, and He would empower us to fight our demonic tendencies as we make our spiritual progress. Šri Narasimha : Šri Narasimha is the 4th incarnation of Šri Vishnu. He had taken this form of half lion and half human to rescue His child devotee Šri Prahlãda from the hands of his cruel and demonic father Hiranya Kašipu. Both Šri Sudaršana and Šri Narasimha have fierce dispositions, feared by evil doers and revered by their devotees. To illustrate this similarity, Šri Sudaršana and Šri Narasimha are depicted back-to-back. Usually, shrines in which Šri Sudaršana Chakra and Šri Narasimha are installed include an opening on the rear side wall through which devotees can view Šri Narasimha and pray while circumambulating the shrine. 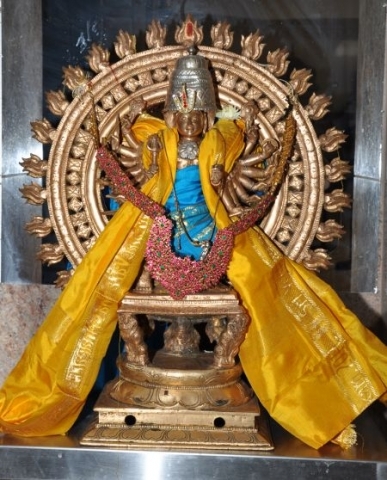 In our Temple a mirror is installed behind the deity so that devotees can view Šri Narasimha reflected in the mirror.